For those of you who are unfamiliar with New Hampshire, our state boasts magnificently tall mountains and sparkling sea coasts. It has granite galore. It has access to Boston for shopping and Vermont for maple syrup and some of the cutest New England towns you’ll ever see. What it does not have is full-day kindergarten. Apparently, it didn’t even have kindergarten until about six years ago. Every now and again a mom will say to me “Oh, you’re so lucky! We didn’t even have kindergarten when my kids were little.” Didn’t have kindergarten? How do you invest in the youth of America with no kindergarten? A mother’s only hope is the new program, K-plus. In K-plus, the kids have regular kindergarten in the morning, followed by an afternoon of more learning, crafts, singing, and play. It’s awesome. It’s the best thing New Hampshire has done since they introduced, well, kindergarten itself. “Oh, didn’t you hear? You didn’t hear. Uh, well, K-plus is full. They don’t have any more spaces,” she said carefully, the way one would speak to someone who is about to receive very bad news. The world stood still for a moment. “Hey! You hurtin’ me! YOU SQUEEZIN’ MY BRAINS!” Henry boomed. I looked down and noticed my fingers clenching the top of his head. Fast forward six minutes and twenty-nine seconds later, after I ushered Henry into his room and assured him he did not have a headache and jumped back in my car and speed-dialed my husband Joe. “HE DIDN’T GET IN!” I shrieked. “They tested him?” he asked, probably considering all of the things Henry is good at that would not help him earn a spot in an educational program, like leaving the house without any underwear or wearing my black high heel boots and belting out the theme song to Frozen. Swearing. Afternoon kindergarten is the worst. It doesn’t start until 11:30, so you wind up feeding your kid lunch at 10:45 after you tried to keep them busy all morning. Charlie had afternoon kindergarten, and let’s just say there was some television involved. 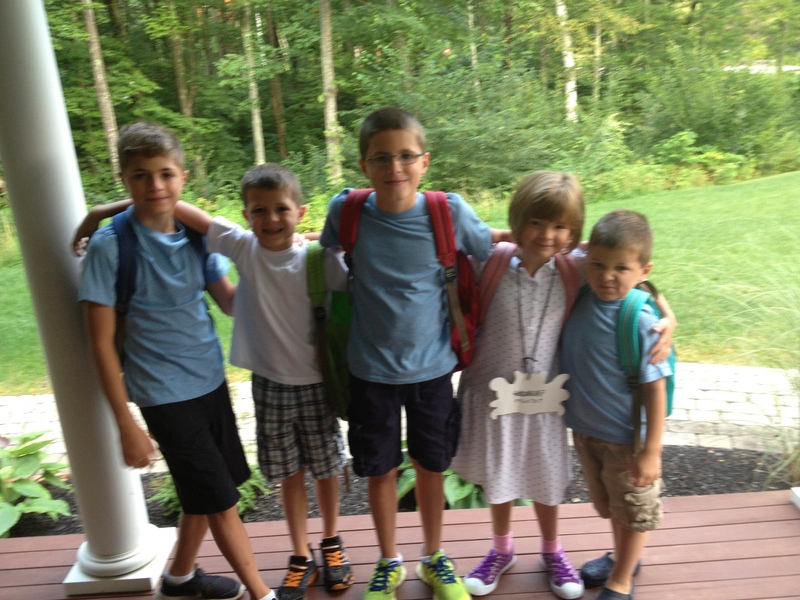 Our first year in New Hampshire, Jack went to an integrated preschool geared towards special needs kids with autism. He took a bus. The following year Joey went to the same preschool as a “typical” kid, only he couldn’t ride the bus because he didn’t have a diagnosis. The same bus that went to the same school with his same brother on it. Now, gentle reader, of course I did not tell Joey to flap his hands a little, that maybe he’d land a spot on the school’s yellow transportation. I never coached him to look blankly over the teacher’s shoulder when she spoke to him, or clap my hands and say, “Yes, yes! Just like that! Now act like you didn’t even hear what I said. Perfect!” That would be weird and unsavory. Do you see the difference? Do you see how that whole middle of the day nonsense just disappears? I would have had from 8:03 until 2:40—an entire six hours and thirty-seven minutes—for whatever shenanigans I could conjure up on my own. Now, of course I’m sad that my last was headed to school all day. I’m not that cold. I was planning on having the good long cry when Henry boarded the bus in the fall – maybe even the ugly cry. And after that I was going to pick myself up and go to the mall. Sentimentality wears thin by child number five. And despite Henry’s best efforts to remain cute and entertaining—why, just the other night at dinner he shoved a pea up his nose and then shot it across the table like a mini cannonball—it is time for him to attend school all day. There are other options, of course. I could bring him to another school in our district where the K-plus program still has spots available. I could enroll him in private kindergarten. I could do a combination of both. I pored over this matrix the way some people contemplate their tax returns. Private kindergarten has no bus. K-plus in another school has no bus. The only way Henry is going to be sitting on a bus without underwear come fall is if I drive him at 11:30 and he takes the bus home. “Maybe we could hire a car service to bring him to kindergarten,” he suggested helpfully. And although the he thought of Henry pulling up to the carpool line in a stretch limo every day did make me giggle, I was still very frustrated. I rolled over in a huff and flipped open my Nook. Pretending to read, I thought about the past eleven years of my life. Between nursing hungry newborns and taking them to preschool and driving to doctor appointments and evaluations and speech therapy and birthday parties and baseball practice, my days have been carved into three-hour blocks for over a decade. I thought back to when I had a houseful of toddlers and newborns, how long the days could seem, how frustrated I was a lot of the time. I cringe to remember how I swatted away small hands when they reached for my bagel and said stop knocking over those blocks you are making a big mess. I said no to more Goldfish crackers and insisted on a rigid bedtime routine. But what I would give to turn the clock back and have one more day with those little hands and feet and faces. One hour, even. I would read another book even if the clock said 8:01 and help tip over towers of brightly colored blocks. I would share my bagel. For me, motherhood is the tender balance of pushing them to grow and trying to keep them small; it is trying to get out of diapers and be done with car seats and teach Jack to say more and show Charlie how to ride a bike and Joey how to make his own sandwich, all the while missing the fresh smell of baby wipes and soothing tender scraped knees and longing to spread the peanut butter just one more time. It is the ebb and flow of regret and shame. As I drifted off to sleep I decided to enroll Henry in half-day afternoon kindergarten, to drive my youngest child back and forth for another year. I decided kindergarten is not only an investment in our youth’s future, but my own as well. Because, God willing, one day I’m going to be an old lady. The house will be quiet; the board books donated and the bright blocks packed away. And in my old age, I may still yearn to turn back to clock, but it won’t be because I want to fix my mistakes or to make right where I went wrong. It will be to see, just one more time, the smile on my five-year old’s face as he climbs off the bus after his first day of kindergarten. love it! I only have two kids and my days are filled with their schedules and blocks of time..oh, and don’t forget the mutt, his schedule is in there too. Some day we will drive past those moms in the kinder line up, on our way to the mall, and feel so bittersweet for not being in that line too. Very good and also heartbreaking. My oldest turned 49 in March and still miss all the things that involved raising my two. Times does pass too fast and then in their younger years too slow!!!!! This makes me laugh so hard! I have a 5,4 and 3 year old. My 4 year old is on the spectrum and attends a special ed preschool program. ( & I just had my 4th 2 wks ago). This, and so so so many of your posts is my life. I turn 40 when my youngest reaches 1st grade and I told my hubby I’m getting a personal trainer and pool boy! Thanks for sharing Jack and the rest of your beautiful clan with us. Reading your book and blog have been such a blessing for me and my sanity ! And when they’re all at school or after they leave school and home your day will be filled with work and squeezing the housework and cooking into the little bits of time left. It never ends.